Raising funds for any youth sports team is a challenge. Parents are expected to fork over money for hockey uniforms, hockey pads, helmets, skates and state-of-the-art sticks, yet there are some excellent young hockey players out there who simply can't afford to play. That's where fundraising comes into play. When the players are sharpening their skates in anticipation of the upcoming hockey season, now is the time to look for volunteer parents, community members and minor hockey fans, who will lend their support to hockey fundraisers. At your first fundraising volunteer meeting discuss what the fundraising will be for. Do you need new equipment, money for uniforms or team jerseys, money for protective equipment (facemasks and helmets)? Do you need the fundraising money to subsidize travel to away games, or hotel accommodations for away games? Do you want to see the charity money go to less fortunate players? All of these questions should be discussed and settled upon in your first meeting. Setting a clear purpose for your fundraising dollars will go a long way in making sure the money is spent smart! Businesses are likely your best bet, as they typically budget money for sponsorship or charity purposes for the entire year. They know how much they can spend ahead of time, and this money can go towards team jerseys, new equipment, travel expenses and hockey workshops for the players. A hand written thank you letter on team letterhead – this should include thanks for the time they are taking to speak with you about sponsorship. It would also be a nice touch to include some images of the team and signatures of thanks from the players as well. Fundraising organizer's contact information – it should include, name, a contact phone number and an email address. 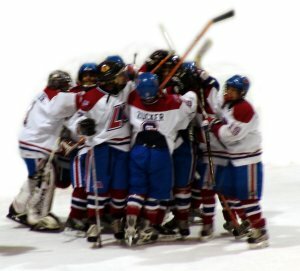 Bring up name recognition – Sponsoring a hockey team is really a win-win situation for most businesses. You are looking for funds to help your team; and they are looking for exposure. Most will expect that you include the business name in the team name, for example if the business is called Douglas Plumbing and your team is called the Penguins, they may want the team to be known as Douglas Plumbing Penguins during their year of sponsorship, or in the least, they may want a logo of their business on the team hockey jerseys. Small companies have long been approached to help fund the minor hockey season. They commonly pay for hockey jerseys, as well as beverages and food at hockey functions. Many small companies will even foot the bill for new equipment and travel expenses for players. That's why it's important to let them know how thankful you are. Extend a hand of thanks by offering season tickets to minor hockey games. For instance make sure 5 to 12 seats are always available for company employees to attend for free. This has a secondary benefit. It familiarizes your hockey players with those responsible for funding some of their hockey season, and it let's the company see just what their money is going towards.